In recent years the Butterfly Tenergy Series is one of the most talked about and popular table tennis rubbers. I often get asked by players what the main differences are between the Tenergy rubbers. Since OOAK Shop is now a Butterfly distributor, giving me easier access to the rubbers, I decided to do a comparison and write this article, to help people decide which version suits their game best. Hope you find it useful! Although I think the Tenergy rubbers are very good and a great choice for some, I also think that there are people for whom they’re not suitable nor can the high price tag justified. However, I respect everyone’s opinions and freedom of choice, so for those that wish to try Tenergy, here is a summary of the main differences and the style they suit best. The article only highlights the key features of the different rubbers, and does not describe each rubber in full detail, but should give enough information to help you make an informed choice of which Tenergy suits you best. Note: OOAK Shop is an authorised Butterfly distributor, and guarantees genuine products and fresh stock. 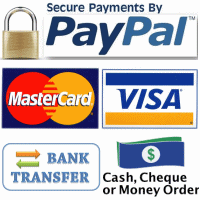 We offer fast shipping as all our goods are in stock. Our FREE professional assembly service is second to none, and includes Butterfly edge tape. Here are the ratings from Butterfly themselves. From my personal experience they are quite accurate, although as we all know, they don’t tell the full story, nor do they reveal enough information to make an informed choice. I’ve included the rating of Sriver and Tackiness Chop as they are well known references and useful for comparison. Don’t try to compare these rating to those from other brands, because all brands use a different system. Speed: The speed of rubber compared to their ‘legacy’ rubber Sriver which has a speed rating of 10. It’s generally accepted that the speed rating refers to that of a topspin loop stroke. Spin: The spin of rubber compared to their ‘legacy’ rubber Tackiness Chop which has a spin rating of 10. It’s generally accepted that the spin rating refers to that on a topspin loop stroke. Control: Unlike most manufacturers, Butterfly doesn’t provide a control rating. I think that’s quite reasonable, since control is so dependent on personal styles, levels and perception, that putting a single number to it is virtually meaningless. Density/Sponge Hardness: The hardness of the sponge as measured with a Durometer; the higher the number, the harder the sponge. This affects the ‘feel’ of the rubber and how far the ball penetrates into the rubber upon impact. Generally harder sponges are potentially more powerful, but you need the power and better technique to take advantage of it. Softer sponges are generally a little easier and more forgiving to play with. These numbers don’t take into account the effect of the topsheet, which is also important to the feel and ratings of the overall rubber. Thickness: The available options for the thickness of the sponge, not including the topsheet. With a thicker sponges the rubber becomes are potentially more powerful, but sacrifices control. For rating for the complete butterfly range, check out this Butterfly Rubber Ratings PDF. The one and only original Tenergy rubber, which made the name famous! Although it’s regarded as a relatively fast rubber, it’s the very high spin, and the easy with which you can generate this spin, which made this rubber so popular for club level players. The Tenergy 05 has a high throw (trajectory) with high spin, great for opening loops and plenty powerful enough to finish a point. Due to the high grip of the topsheet, the rubber is very spinny for all strokes, and ideal for a close-in to mid-distance loopers and counter-loopers. Pros: High speed, highest spin, good touch. Suitability: Suitable for most offensive loopers at intermediate to high level from close-in to mid-distance play. Not suitable for beginners. 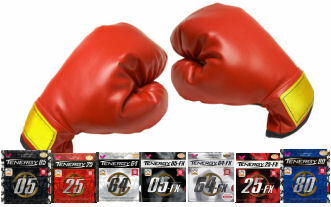 The Tenergy 64 is a definite step up in speed compared to the 05, even though the ratings only indicate a tiny increase. Although the sponge is the same as the 05, the topsheet is different, with different aspect ratio and spacing of the pimples underneath the surface. This makes it faster and gives it a softer feel but also more bouncy. 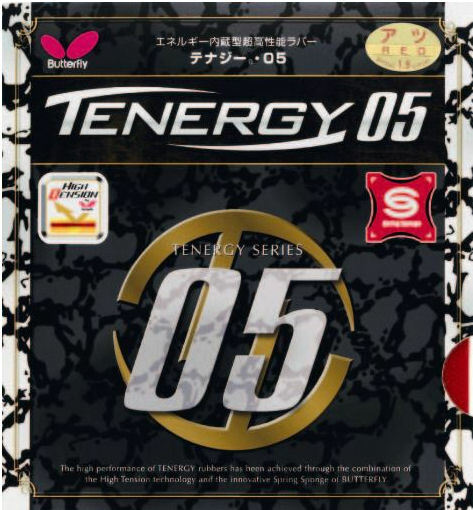 Tenergy 64 is fast rubber with a high throw, requiring even less effort to get good speed, and although the spin is still high it’s not as high as the 05. It is most suitable for mid to long distance loopers. The more bouncy surface makes the short game a little harder to control and requires more active strokes. More suitable for forehand where the high throw and more lively surface is more easily controlled. Suitability: Suitable for offensive loopers / counter-loopers at intermediate to high level for mid-distance to far distance play. Not suitable for beginners. Although the Tenergy 25 has the same high grip or bite as the others in the family, the pips underneath the surface are much wider, making it less suitable for looping and better for a blocking and counterattack-style game. The larger pip structure also gives it the hardest feel of the all the Tenergies. Although the speed ratings say otherwise, I believe it’s a little slower than all the other Tenergy rubbers. The wide pip structure does make the rubber feel very stable, giving it the best touch and very good accuracy for blocking and hitting. Pros: Good speed, high spin on serves/pushes, very good touch, high accuracy. Suitability: Suitable for offensive hitting, blockers or counter-attack style players from close-in to mid-distance play. 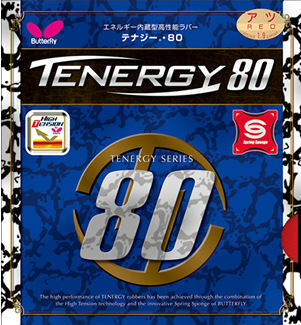 Tenergy 80 is really the ‘jack of all trades’ of the Tenergy series, but the ‘master of none’, except perhaps in the control area. It provides high spin on loops, second only the Tenergy 05. Speed is high, but not quite that of the Tenergy 64. The touch in the short game is among the best of the series and close to that of Tenergy 25, and the accuracy on blocks & hits is almost that of the Tenergy 25. For players that play an all-round offensive style game this may be the ideal one of the Tenergy series, yet other may not be willing to sacrifice the spin of the Tenergy 05 or the speed of Tenergy 64, for the extra control it offers. Pros: Good speed, high spin, very good touch, good accuracy. Suitability: Suitable for most offensive loopers at intermediate to high level from close-in to mid-distance play. In a nut-shell, here are the main differences between the rubbers, noting that the difference is not huge for many of these parameters. The Tenergy rubbers are made in 3 different sponge sizes (thickness), being 1.7, 1.9 and 2.1mm. In general the thinner sponges will give you more control and feel of the ball, whereas the thicker sponges will give you more speed and spin potential for power-loops and counter-loops. I would only recommend the 1.7mm sponge if you’re spin and control type looper and do not counter-loop but block instead. If you don’t loop at all, the 1.7mm would likely be the most suitable as well, but I would question whether you should be playing with Tenergy at all, since the loop is definitely its main strength (except for the Tenergy 25). Whether you should use 1.9mm or 2.1mm really depends on your level and how hard you loop or counter-loop. Unless you’re in one of the top grades of your club or higher, 1.9mm would probably benefit your more in the extra control and touch that it offers. Buy Tenergy rubbers direct from OOAK Shop here (price in $AUD). You can find Butterfly Table Tennis Bat recommendations here.